Prior to moving to the New York/New Jersey area, I used to think that I knew what traffic was. I was sorely mistaken. Back in the midwest, when you get stuck in "traffic" you might be crawling along at a snail's pace but at least you're still moving. On the east coast, when you get stuck in traffic you are literally stuck in the same spot. For. Ev. Er. Nowhere is this more true than at the few bridges and tunnels which connect the state of New Jersey to New York City. Each one of them is infamous within its own right. Today's story will focus on one in particular: the George Washington Bridge ("GW Bridge"). The approach to the GW Bridge can be crazy. Over 100 million cars travel over the GW Bridge every year - that's a third of the United States population! That breaks down to over a quarter millions vehicles every single day. So you can imagine that the traffic over this bridge is already sick. Now imagine that a government official purposely blocks several lanes of traffic on the GW Bridge. Crazy right? Who would do such a thing? Well we're not done yet. It gets worse. Now imagine that due to those closed lanes, emergency workers could not rush a woman to the hospital and she died. That's pretty bad right? But wait, there's more. 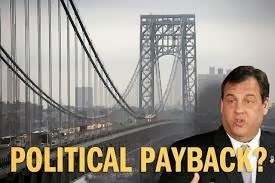 Now imagine that the REASON why the government official (a Republican) blocked several lanes of the GW Birdge was to get back at the Democratic mayor of a small New Jersey town located next to the GW Bridge all because said mayor did not endorse the Republican governor of the state during his 2012 campaign. That, ladies and gentlemen, is Bridge-Gate. An unusually contrite Gov. Christie emerged Thursday to offer a statewide apology for the George Washington Bridge traffic scandal — and to fire two of his top advisers. The governor then announced the immediate dismissal of Bridget Anne Kelly, the top aide linked directly to lane closures meant to retaliate against Fort Lee Mayor Mark Sokolich who did not endorse the GOP incumbent during his re-election campaign last year. 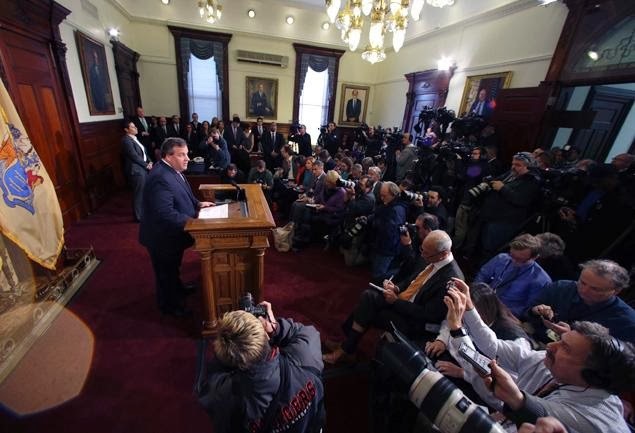 "I terminated her employment because she lied to me," Christie said bluntly. The governor also revealed that he told his former campaign manager, Bill Stepien, to withdraw his nomination as state GOP chairman. Christie said the tone of emails involving Stepien made him lose confidence in the political adviser. He also promised a Thursday visit to Fort Lee to deliver a personal apology. Christie, known for his take-no-prisoners political style, did deliver a bit of self-defense. “I am not a bully,” insisted Christie, who repeatedly stressed that he had zero involvement in the decision to close down two traffic lanes in Fort Lee. “I had no knowledge and involvement in this issue, in its planning and its execution," the governor said at the end of his 20-minute opening statement. Christie said he first learned about the involvement of Kelly and Stepien at 8:50 a.m. Wednesday. By 9 a.m., he said, Kelly was fired. Christie, speaking in a calm and direct fashion, said Kelly had lied when directly confronted about the incident. Christie, taking questions from reporters, said he accepted at face value the statements made by his staff and his appointee at the Port Authority. Christie acknowledged there is now no denying the nefarious forces that caused four days of gridlock at the world's busiest bridge. “It's clear now that in the minds of some people there were political overtones of political side deals in this,” he said. A day earlier, Christie — considered a top GOP front-runner for the White House in 2016 — saw his hopes for the presidency hit a huge political pothole after the correspondence was made public. Kelly and a long-time Christie pal appointed by the governor to the Port Authority were caught in an Aug. 13 email exchange planning the roadway retribution. “Time for some traffic problems in Fort Lee,” read the email from Kelly. “Got it,” responded David Wildstein, who went to high school with the governor — and was appointed by Christie to a $150,000-a-year position as PA director of interstate capital projects. 1. Do you believe Christie is being sincere here about not knowing what was going on in his staff? 2. Does this damage his Presidential bid for 2016?